– 2 packs of vanilla whip dessert, in powder form, Angel Delight type, except that Angel Delight doesn’t come in vanilla flavour so I used Morrison’s supermarket own brand. Each pack was 47g, but I noticed that Angel Delight packs are 59g each, so other brands might vary, doesn’t really matter (Original recipe is 2 x 3.4oz packs Vanilla Instant Pudding mix). (Original recipe uses 2 x 14.4oz packs graham crackers. 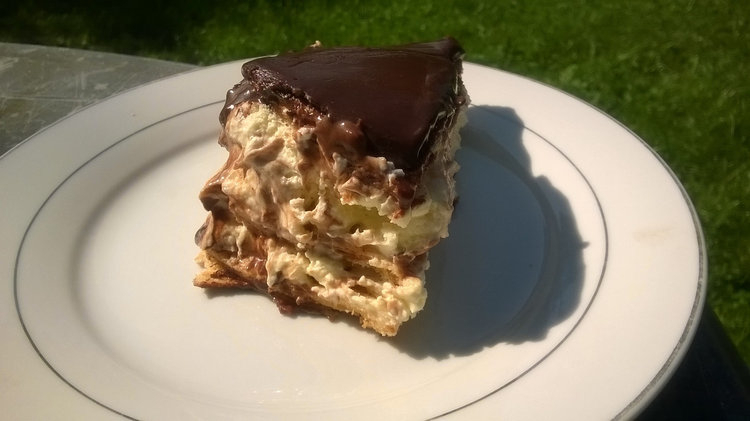 We are often told that we can substitute digestive biscuits for graham crackers, but I really didn’t think that would work in this particular recipe, so I figured that ice-cream wafers, once softened by sitting in between cream layers, might most closely resemble the choux pastry that is usually used for eclairs). (Original recipe used half those quantities for the frosting, but in the write-up she said that she usually doubles the frosting quantity, so I just went straight for that – why scrimp on the chocolately bit right?). Was that the most detailed ingredient list you’ve ever read? Just wondering. 1. Whip the cream until stiff (tip the bowl upside down and it doesn’t move). 2. Whip the vanilla dessert powder with the milk for about 2 minutes until thick and creamy, then fold it into the whipped cream. 3. Using a pan approximately 9 x 13″, place one layer of single wafers, you’ll need to break them up to fit. 4. Spread half the cream mixture on top. 5. Another layer of wafers. 6. Another layer of cream mixture. 7. A final layer of wafers. 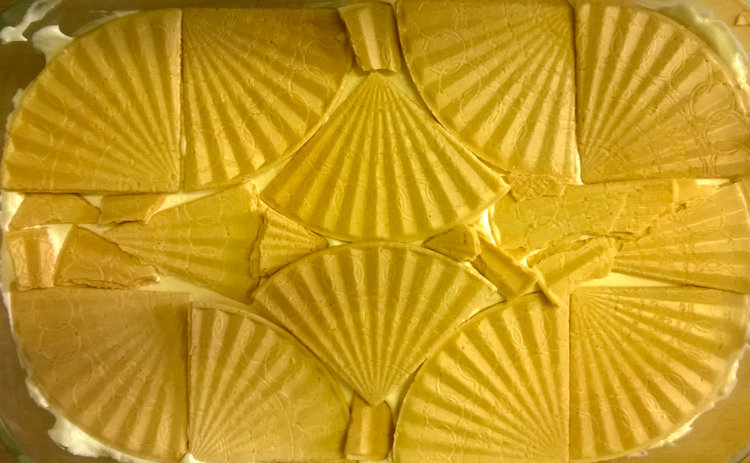 This is what my top layer of wafers looked like, rather art deco wouldn’t you say? 8. Melt butter and milk together in the microwave until butter is just melted and liquid. 9. Sieve the cocoa and icing/powdered sugar into a bowl. 10. Pour the melted butter and milk on to the sieved cocoa and sugar and beat well together until smooth and glossy. 11. Pour over the top of the cake and smooth out. Refrigerate. 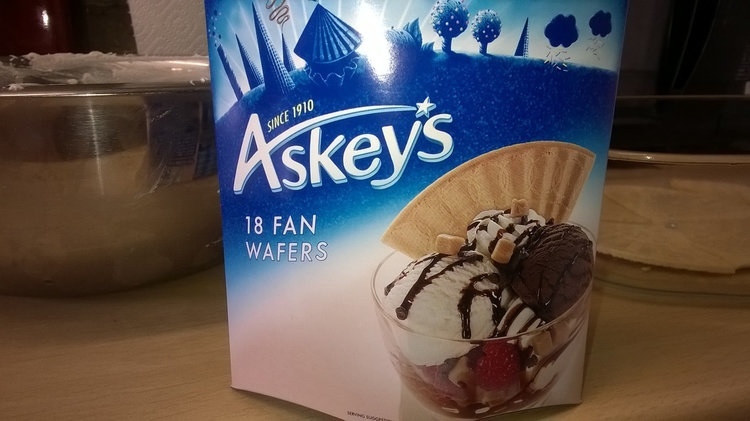 IMPORTANT NOTE – This really does need to be made the day before to give the wafers enough time to soften in the cream. The original recipe with graham crackers also says to make the day before. I initially made it in the morning and thought it would be fine by the evening, but it wasn’t, the wafers were still quite hard. By afternoon the following day they were better, still a little chewier than I might have wished though, but really not a bad approximation of choux pastry. Next time I might look for thinner wafers as these ones are quite substantial (oh yes, there will definitely be a next time). I go weak at the knees for a whipped cream dessert. Of course, if I eat too many of them, I’ll go flabby at the knees… Looks yummy! It feels very naughty and indulgent to eat I must say! 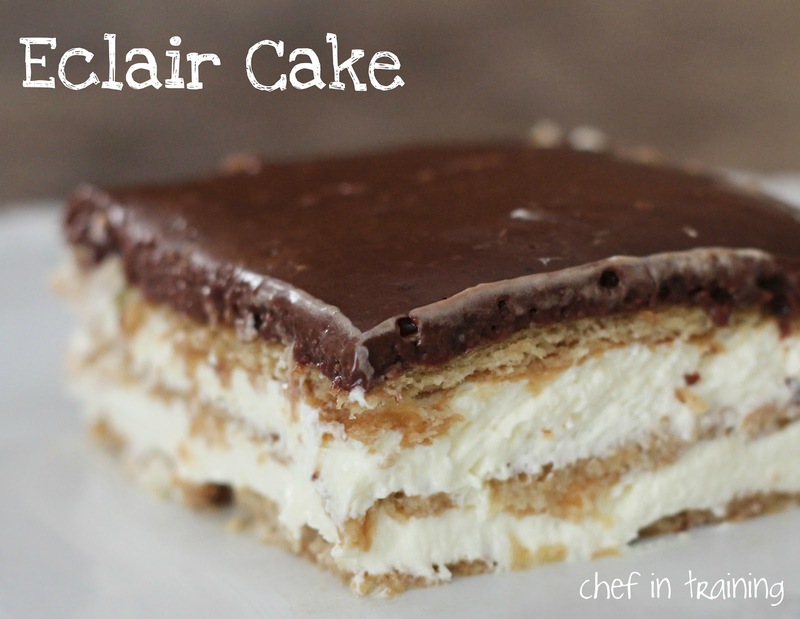 It’s not overly sweet though which I like, obviously the chocolate frosting is very sweet but the cream filling is only slightly sweetened – I think the original version probably tastes sweeter because Cool Whip is sweetened whereas the cream I used isn’t. I love that you're not afraid to substitute and experiment. The first time I baked anything I had to substitute and I was ticked, (age 13) but it made for adventurous cooking and baking in future. Hop to it, won’t you? My desert of choice is red wine, but once in a blue moon chocolate and creamy things call to me. I have to watch my ****** figure after all. If I don’t, who will? I’m sure you’ve never thrown anything out. I once heard a young wife threw a whole roast in the garbage because her husband was late home for supper. I couldn’t sleep for weeks. What a waste. Why waste time cutting it into slices – just eat the lot! Is that where it went then? It’s probably less the cutting technique – or even the knife used – than it is the structure of the cake itself. I’d guess graham crackers, which are significantly firmer than wafers, allow for a more distinct slicing action. Though, I think you’re right that the wafers better approximate choux pastry. One tip I learned from making sushi is to use a very sharp knife and wet it, just barely, between each slice motion. No guarantees, but that might allow for a more precise cut. Running the knife under hot water (and then quickly drying it) might help, too. That’s supposed to help it glide more smoothly and quickly through a variety of textures. Your substitutions sound much more tasty than the original. Anything that features Cool Whip is flat and artificial to my taste buds! Mayumi suggested wetting the knife too. I agree about the cream substitution, I would use real cream in this even if I could get Cool Whip easily here.